Over the years as people have attempted to use a 2G Blackbox ECU or an Evo 8 ECU in their DSM, people have asked a lot of questions regarding the flash port. 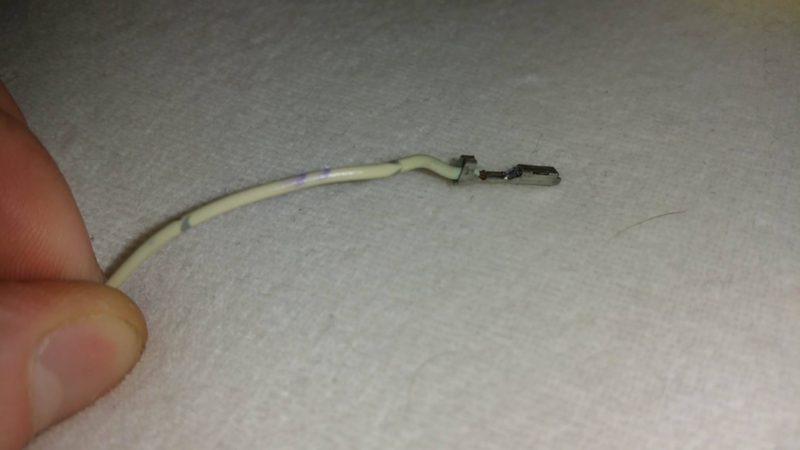 How to hook it up, what is it, what pin do you wire it into, etc. I figured I would make an article about it to clear up future confusion. 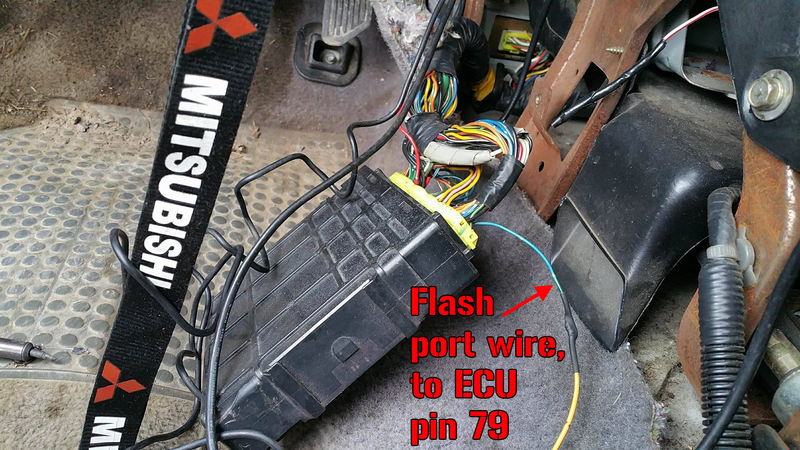 When using a 2G Blackbox or Evo ECU, you need to wire in the flash port if you intend on tuning, as you need to “flash” the ECU to apply changes. Without the flash port wired in, you will only be able to log via EVOscan, but won’t be able to tune with ECUflash. There are two different cables you can use to tune and log- the OpenPort 2.0 cable and the OpenPort 1.3u cable. The 2.0 cable is used with the 2G Blackbox ECU. It plugs into the OBD2 port and uses a mini USB cable to connect to your laptop, and a 2.5mm mono headphone jack for the flash port wire. The 2.0 cable also has a slot for an SD card that allows you to log without using a laptop. Any time you drive your car, you will automatically be logging and can view your logs later on with your laptop. 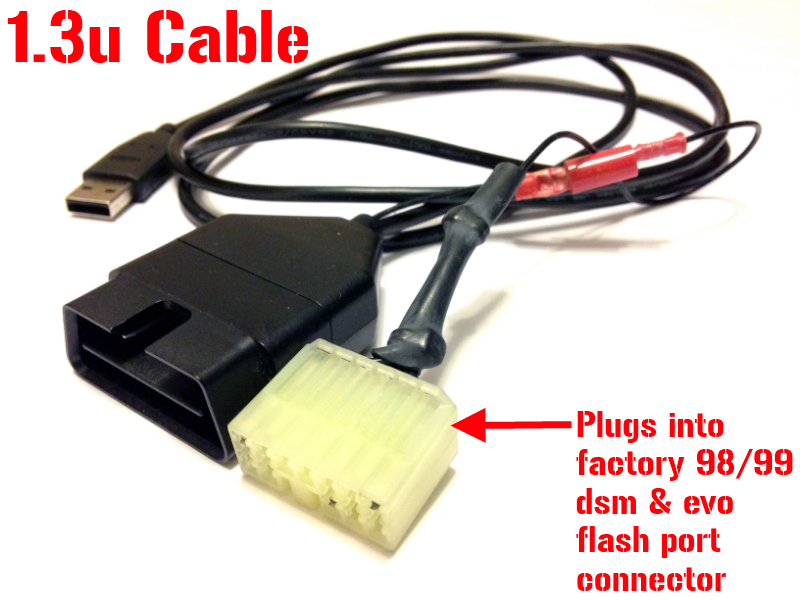 The 1.3u cable is a little different and is used with the Evo ECU. The flash port wiring and the wiring to the computer is built into the 1.3u cable which doesn’t allow you to simply unplug the individual wiring like you can with the 2.0 cable via a 2.5mm mono cable. The 98 and 99 DSM’s, as well as the later Evo’s, come equipped with a plug to connect your end of the flash port to. But, the rest of the 90-97 DSM’s don’t come with it. 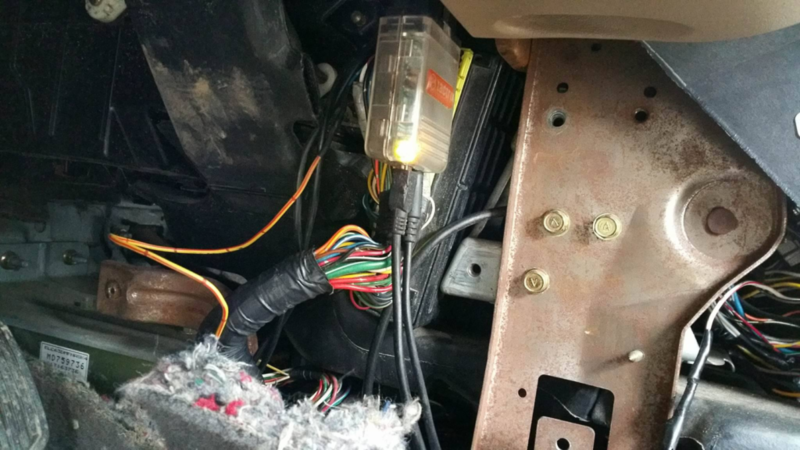 What most of us do is wire the flash port directly to the ECU. You can, however, purchase the other end of the 12 pin flash port if buying the 2.0 or 1.3u cable brand new. The flash port is a 12 pin connector, but only 1 pin and wire is used. 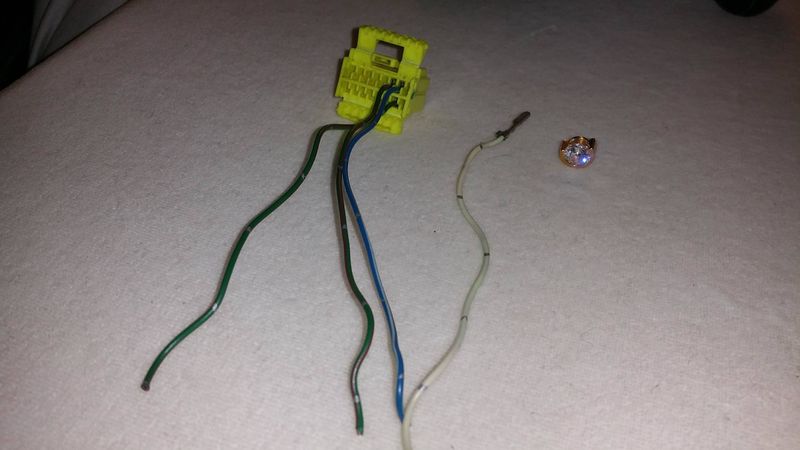 Another solution is to go to the junk yard and get the connector from any later Mitsubishi, like a Galant or Lancer, or even a 3G+ Eclipse. The connector is located directly next to your OBD2 port. The flash port wire on the cable side (2.5mm mono wire) will have two wires inside of it. In my case, it was a white wire and a red wire. You only want to use one wire, which for me was the white wire. Wire colors may differ between brands, styles, etc. If you have a 90-97 DSM, you will not have the factory flash port, nor will you have the wiring to the ECU for it. 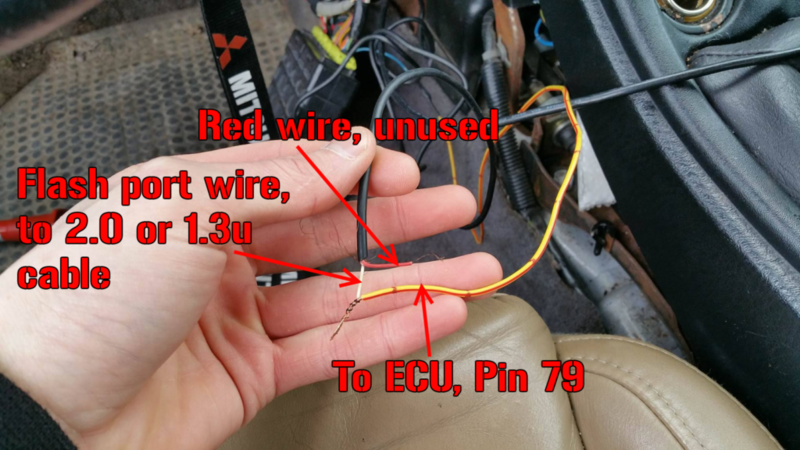 So, you have to add the wire and pin into the ECU harness. To do this, you can remove a pin that is not used on your harness (AC, emissions, EGR, etc.) or you can get a spare ECU plug from the junk yard or whatever and snag a pin out of that. For more information on how to extract and install pins in an ECU harness plug, see THIS article. Below is what an ECU pin looks like. You basically just add a pin to pin 79 of your ECU harness, and run it directly to your flash port wiring on your 2.0 or 1.3u cable. 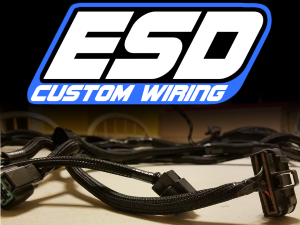 It helps to attach extra wiring to the ECU pin wire to give you more room to work, especially if you have a short flash port wire off of the 2.0 or 1.3u cable. 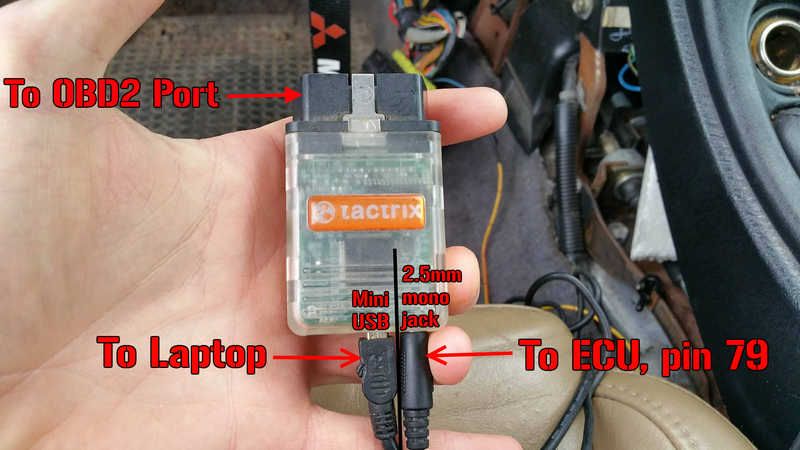 Although, the wire doesn’t need to travel far as the ECU is really close from the OBD2 port. In the picture below, you can see the flash port wiring that runs directly to the ECU harness. 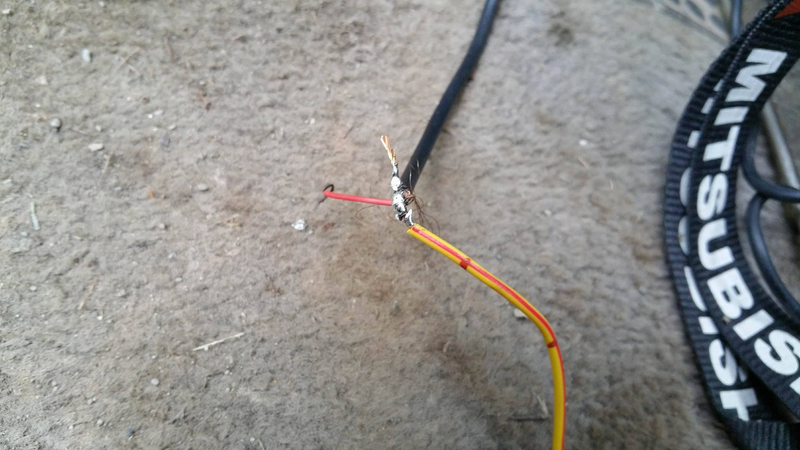 Of course when doing any wiring, be sure to solder your connections. Again, you are only using one of the two wires in the 2.5mm mono cable.